Growing up my mom called these “Home Fries” and would serve them if we had hamburgers for dinner on the weekend. I always thought of them more like potato chips but a little more substantial since they are thicker. This is actually going to be a two part post because while you can certainly enjoy these by themselves, I actually made them for a really guilty pleasure. 1. Clean your potatoes well. Peel off the skin if you wish, I leave them on. Slice your potatoes thin and evenly. No more than 1/8 of an inch, but a little thinner is better. A mandolin is perfect for this, but not necessary. 2. You will probably have to do this in a couple of batches or using more than one baking sheet at once. So take a portion of the oil and brush a good amount on the sheet. Then take the potatoes and swipe them in the oil on one side and set them down on the other. Similar to how you would dredge chicken or fish in flour. Keep them in a single layer. 3. Bake in a 300 degree oven for about 24-28 minutes or until the chips are browned. Remove from the pan onto a plate lined with a paper towel. Allow excess oil to be removed and season with salt and pepper. (Or just salt if you prefer.) Repeat until done. Serve immediately. Thoughts: The most important thing is to slice the potatoes as evenly as possible, otherwise they won’t cook evenly. These are crispy and taste so much like a potato chip from the bag you may never buy a bag of chips again. If you don’t prefer the dark russet variety (the Cape Cod variety is my favorite), just take them out when they are a light golden brown. Since they are slightly thicker than regular potato chips, they are also excellent for dipping! Note: Once the chips are completely cooled, you can store them in an airtight container for 2-3 days. Check back tomorrow for my 2nd part of this post! Thanks Georgia! And you are right about them being healthier! I love homemade potato chips! Looks delicious. 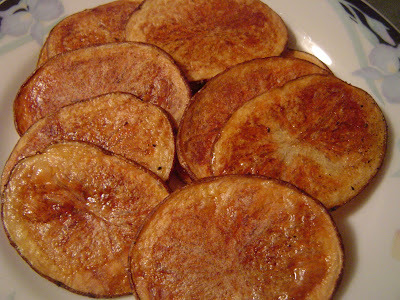 I just remembered, my aunt always make homemade potato chips for us.